Percival is a dark sable. He was born September 25th 2011. He will be soon getting a friend. The story on how I got him isn't at all how I had planned on getting ferrets, but he is here and I can't change that fact. My boyfriend was attempting to console me after Losing my rat Bea during her spay last week, and he went to Petco and got him. It's hard to be completely angry with him for doing this since I have told him several times how I feel about pet stores, but I know he did it out of love. 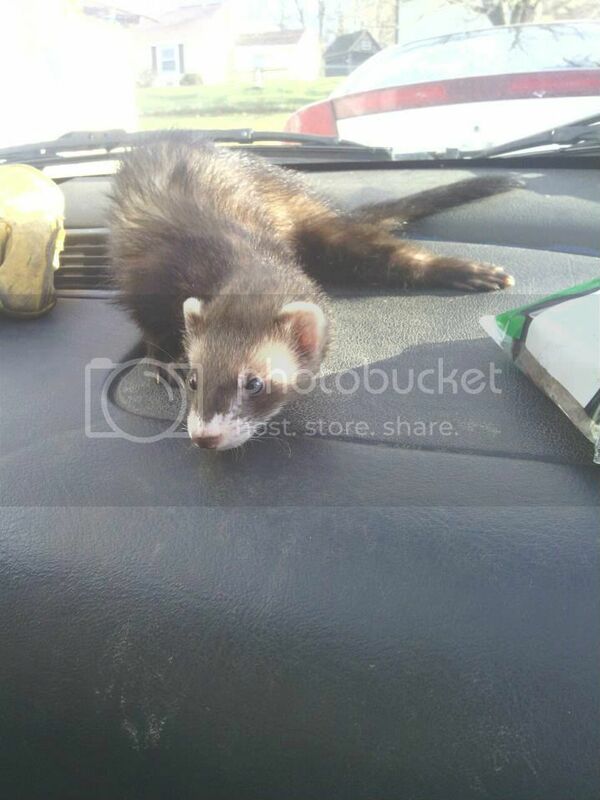 I told my boyfriend he will now have too look into ferret rescues or craigslist to find Percival a friend. I was proud of him for buying everything Percival needed, although I plan on switching him to raw, the marshall food stinks and so does his poo. I have joined the holistic ferret forum so I can get all the info on raw feeding. My boyfriend also was correct on getting a dark sable boy, so that part he listened too. He said the pet store lady told him to use pine bedding, but he knew better. So now she lives with us and is very funny. Sounds like Percival has quite the life with you, post some photos when you get a chance. Congrats on your boy! 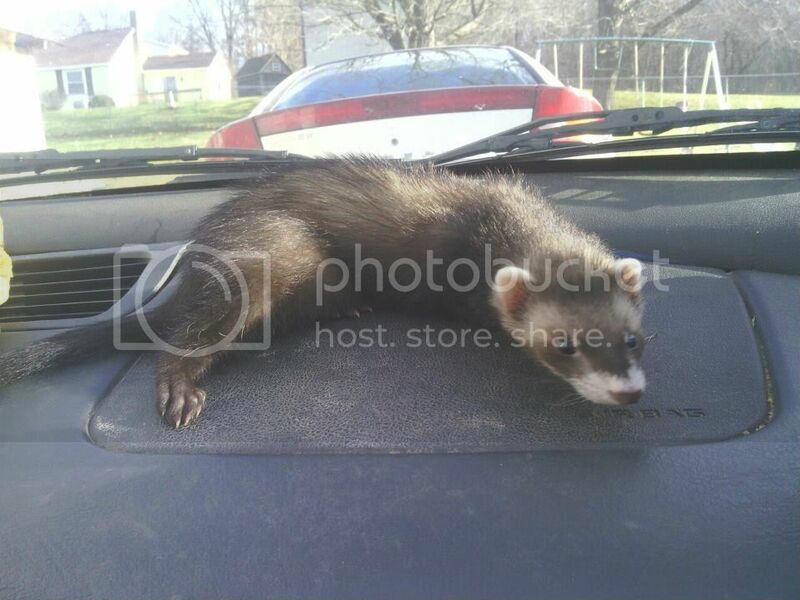 Marshall's ferrets tend to be one of the more docile mill ferrets. They're generally pretty chill. Of course, there's always exceptions. I love that ferrets don't chew their bedding like rats, makes it easier to spend lots of money on them. Congrats on your new family member! 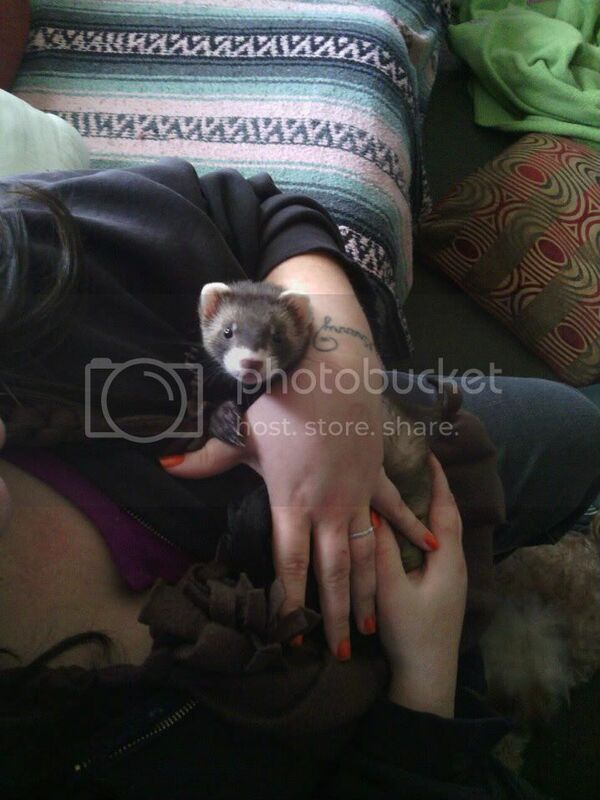 I hope you have lots of fun with him I am very jealous as I would love to own ferrets one day. Here he is on the day I got him.. I just love his fur color. Percival has a very wonderful personality. He has already learned to fetch. He is still on Marshalls ferret food, with a small amount of raw. So far he loves chicken, especially the fat and skin. Im still nervous about giving him raw chicken bones. My last ferret died because of an obstruction in her intestines so now I am so paranoid about what Percival eats. I think maybe once I hear of others letting their ferrets eat the raw bones I will hopefully feel more assured. Since am a stay at home mom Percival will get alot of attention. I have been carrying him around in the no sew satchel I made for him. Since we have been on the go during the holidays I have taken him everywhere with me. I took an extra medium size dog kennel(plastic kind that he can not get out of) to my moms house, plus I have a cat carrier to use as a traveling cage. At home he has the single level CN for now. I still need to decided whether to keep using the CN or use my large puppy kennel. I like the kinnel because it has a pas similar to the bass pan where an the CN just has it's original flat pan. The kennel is 30''x40''x30'' in size. The entire top folds open and there is two large doors in the front. Im thinking about having my boyfriend remove the clamps that hold the floor so that I can just set the cage over the bottom pan, making it easier to lift and clean. Right now I would have to lift open the top door, remove the shelves, hammocks etc, to get the pan out. I used the kennel for the rats for a while and it was a pita to clean that way. More then likely I will get the CN add on unit so I have room for when we get Percival a buddy. I have myself 3 ferrets, and I love them so much ! I've posted some pictures in another thread .